Travel reports show that more and more people are heading to the countries of Central America, and it's easy to see why. With travel becoming increasingly accessible and lots of places around the world becoming heavily dominated by tourism, the crowds are building up at the big tourist hotspots around the world, leading to more people heading off the beaten path to more pristine, untouched locations, many of which can be found in Central America. Costa Rica is a perfect example, with this amazing country developing a growing reputation for its amazing scenery, forests, beaches, and wildlife. So whether you're admiring the Arenal Volcano or strolling through a place like Corcovado National Park or the Monteverde Cloud Forest Reserve, you'll find a lot to love in Costa Rica, but you need to play each and every aspect of your trip carefully to avoid encountering any problems along the way. This includes sorting out your money. Costa Rica has its own currency that you need to be aware before visiting, and it can quite literally pay off in a big way to know all about Costa Rica's money in advance, so let’s take a closer look at some details on the currency of Costa Rica. The official currency of Costa Rica is the colón. The plural of colón is colones, and the symbol for the Costa Rica colón is ¢. A single colón was historically made up of 100 céntimos, but the céntimo is now out of circulation, so you only have to worry about one unit of currency when visiting Costa Rica. The value of the Costa Rican colón can change from one month to the next depending on the shifting values of the currency markets around the world, but for general reference, a single colón is worth less than a United States cent, with one United States dollar being valued at several hundred Costa Rican colones. For more accurate and up to date info on the value of the Costa Rica colón, you can check out live currency conversion charts and sites. The coins are made from different metals and formed in different sizes, with the larger value coins being larger in size, naturally. The smallest coin, at a value of 5 colones, is made from aluminum and has a diameter of 21.5mm, while the largest coin, at a value of 500 colones, is made of a mixture of bronze and aluminum and has a diameter of 33mm. 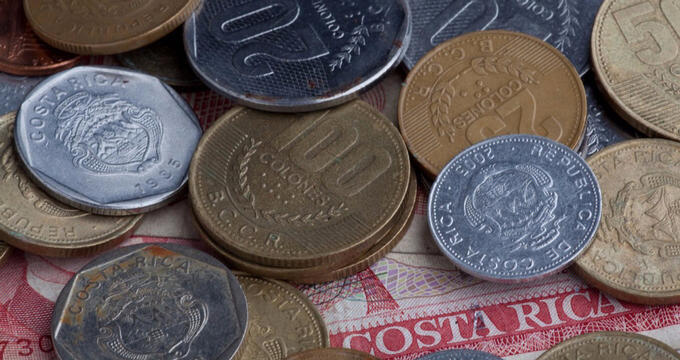 All Costa Rican coins bear the value on one side and the national coat of arms on the other side. Again, the notes get larger as the value increases and they work on a color-coded system which makes it easy to differentiate between them. The 1,000 colones note is red, the 2,000 colones note is blue, the 5,000 colones note is yellow, the 10,000 colones note is green, the 20,000 colones note is orange, and the 50,000 colones note is violet. Each note is decorated with a figure from Costa Rican history on one side, with examples being Alfredo Gonzalez Flores and José Figueres Ferrer, and an image of some of the country's landscape and wildlife on the other like a rainforest scene and brown-throated sloth on the 10,000 colones note. Using a credit or debit card in Costa Rica is generally fine as long as you stick to the big cities and touristic areas. As you head out to more rural locations that are less commonly-visited by tourists and less populous in general, you will find that the likelihood of your card being accepted begins to decrease. In addition, it's worth noting that some banks will charge hidden fees whenever you use your code in a foreign country, so it's wise to check with your bank before traveling anywhere and see what their rules are. Conveniently for citizens of the United States, the US dollar is an accepted form of currency in many locations around Costa Rica. This is a big bonus for American travelers as it means you don't need to worry about getting your cash converted when you book a trip to Costa Rica. US dollars will be accepted at most locations around the country, especially in the big touristic areas and cities, but there are a couple of caveats to this. Firstly, when you get your change, it's highly likely that it will be in the form of colones. Also, many places will not accept the larger dollar bills like a $50 or $100 bill Even a $20 may not be accepted in some locations, so you might want to switch to colones or use your card in those situations. -If you plan on getting some colones, be sure to check out multiple locations to see the different rates and get the best deal before actually handing over any cash. A slightly better rate can result in much more spending money for you and your fellow travelers. -You’ll find ATMs all over Costa Rica, so don’t need to worry about carrying too much cash on your person at any one time. Just remember that you may get charged for using a foreign card in a Costa Rican ATM, so don’t do it too often. -Traveler’s checks aren't really recognized in Costa Rica so there's little point in using them. -Tipping isn’t a big part of Costa Rican culture, and you’ll usually find that a small gratuity charge is automatically added to bills in restaurants anyway, so you don’t need to worry about tipping as much as you would in other locations, but can still choose to do so if you wish. -Unless your bank charges you an extra fee for using your card, it makes sense to use cards in general throughout your trip to Costa Rica as they’re very simple, practical, easy to carry around, and accepted almost everywhere. -If you plan on getting cash converted in Costa Rica, do so at banks, hotels, or at the airport. Avoid other locations or street traders. -Traveler's checks can be used in Costa Rica but only to withdraw money from banks. You can't use them for direct purchases. -Keep some coins and notes on your person just in case. It’s always useful to have a little cash around for those situations when your card isn’t accepted.